Last Tuesday I had to travel down for a meeting in the afternoon. As I was travelling on an “off peak ticket” the first train I could catch for the return journey only leaves at 7:30, so J decided to travel down with me and make a day of it. After my meeting we met up at the National Portrait Gallery where we had a look around the BP Portrait Award exhibition before heading over to the British Library to visit the current exhibition about the voyages of James Cook. 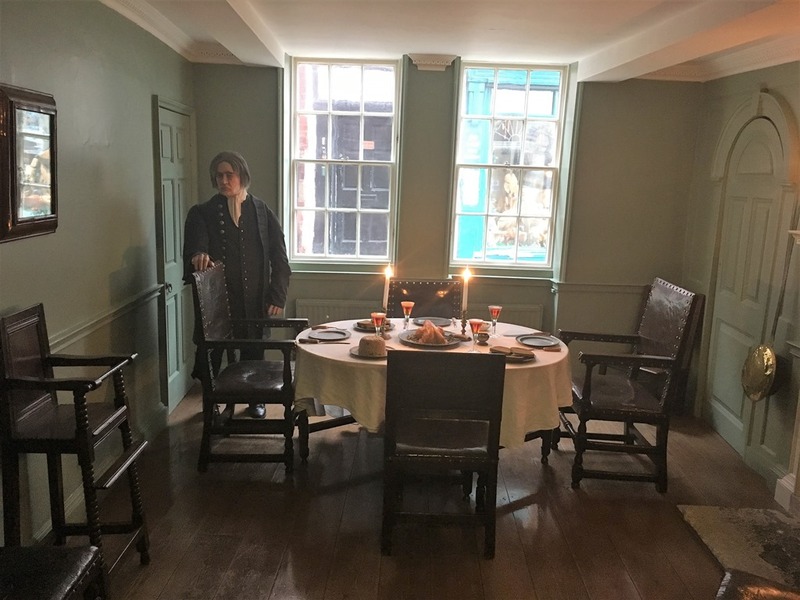 We have a particular interest in him as he’s in my wife’s descended from one of his siblings and last year we’d visited the Cook Memorial Museum in Whitby as well as his parent’s home which has been transplanted in Fitzroy Garden’s in Melbourne. It was an excellent exhibition and we ended up spending longer there than we’d anticipated. It covered in some detail all three of Cook’s voyages with exhibits including maps, charts, journals, books, drawings, paintings, many of which were produced by the artists, scientists and sailors on board the ships (including Cook himself) and a series of short videos giving different perspectives on the voyages. After a brief introduction to Cook and the background, there was a separate section of the exhibition devoted to each of the three voyages. and pictures by the expedition artists and other crew members, including the earliest European depiction of a kangaroo. One thing that particularly came across to me from this exhibition was the role of Polynesians from Tahiti who guided the British expedition to islands they were already aware of and also helped as translators as well as, to some extent, smoothing the way, when encountering indigenous Polynesian peoples on the newly “discovered” (by Europeans) lands. In particular, Tupaia, who joined first voyage, travelling on to New Zealand and Australia. There were a number of drawings by Tupaia in the exhibition. The official objective of the 1st expedition (1768–1771) was to observe the Transit of Venus to aid the calculation of the distance from the Earth to the Sun, but the Admiralty provided Cook with secret orders to search for land and commercial opportunities in the Pacific. So Cook and his crew are best remembered for being the first Europeans to discover and chart the Eastern shores of Australia, properly explore and chart the shores of New Zealand and to “discover” a number of Pacific islands. Of course, all these lands had been discovered many years before by the people who were living there when the Europeans arrived. The objective of the 2nd expedition (1772–1775) was to search for the Great Southern Continent, believed by some in Europe to encircle the South Pole. They travelled further south than had been done before, were the first ships to cross the Antarctic Circle and the Resolution set a record for the Farthest South that would stand for 49 years. They didn’t find land (not travelling far enough south to reach Antarctica)and Cook ruled out the existence of a continent ‘unless near the pole and out of reach of navigation’. The expedition also revisited Tahiti and New Zealand and “discovered” several new Pacific islands as well as South Georgia which he claimed for Britain. The latter was occupied by Argentina during the Falklands War. The secret aim of the 3rd voyage (1776–1780) was search for a Northwest Passage linking the Pacific and the Atlantic. Again, they sailed into the South Pacific where they visited Tonga, Tahiti, Tasmania and New Zealand and the Hawaiian islands before sailing north to Canada and then Alaska. They crossed the Bering Sea over to Asia and crossed the Arctic circle, but further progress was blocked by ice so they failed in their quest to find a North West passage. Sailing south they called in at the Hawaiian islands. It was here, on 14 February 1779 that Cook was killed on the beach along with 4 marines and 16 Hawaiians, following a dispute over a stolen boat. The expedition carried on without him travelling to Kamchatka in western Russia and China before returning to Britain. These were epic journeys demonstrating tremendous navigational skills, seamanship and chart making abilities. But there was a legacy. The discoveries and charts enabled the subsequent occupation, colonisation and subjugation of the indigenous peoples of these lands. So it was good to see that the British Library provided some different perspectives other than simply praising Cook in a series of short videos. 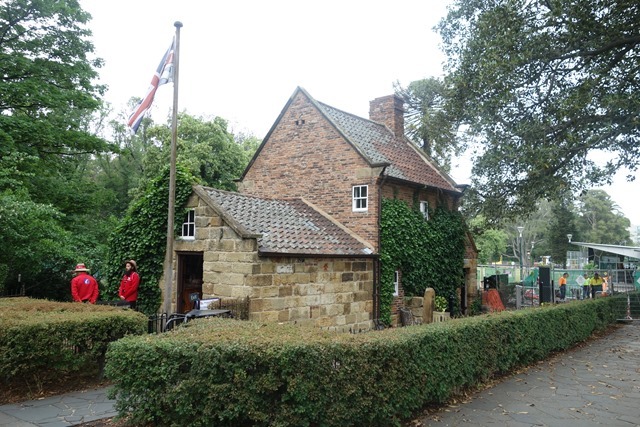 The oldest building in Australia stands in the middle of Fitzroy Gardens in central Melbourne, only a short walk from our Appart-Hotel. 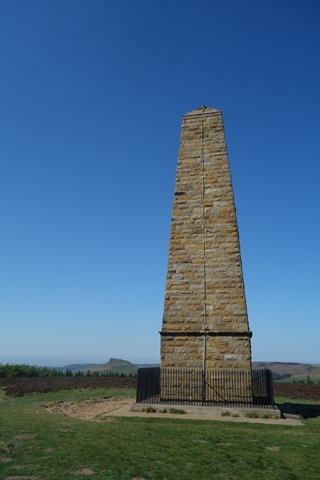 It wasn’t actually built in Australia but in Great Ayton and was the home of the parents and other family members of James Cook the renowned 18th century explorer and navigator who is something of an icon in Australia. The cottage was brought to Melbourne in 1934. 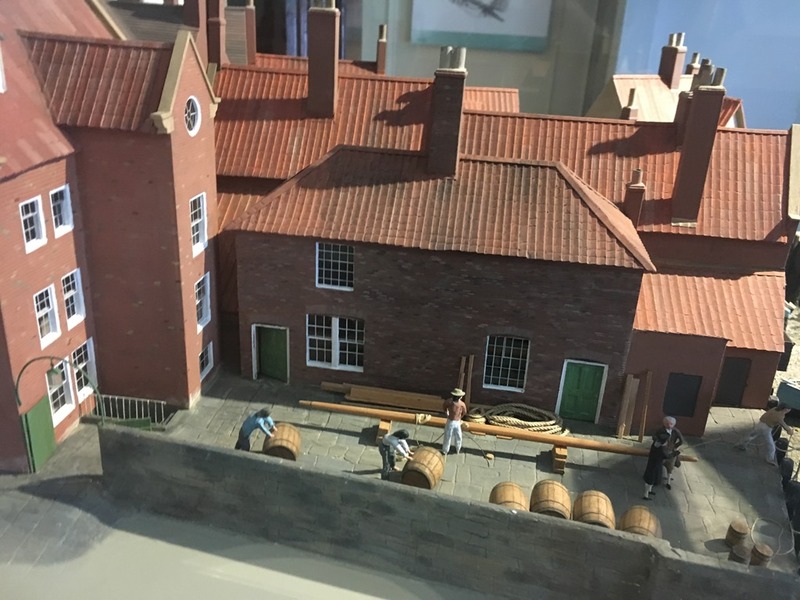 Each brick was individually numbered, packed into barrels and then shipped to Australia where the cottage was re-erected. Cuttings from ivy that adorned the house were also taken and planted – I doubt they’d get away with that today given the strenuous measures taken when entering Australia to prevent foreign specimens being imported..
We have a particular interest in Cook as he’s in my wife’s family tree – she’s descended from one of his siblings (as are my children, of course!). So we could argue that it’s her ancestral home! So a visit while we were staying in Melbourne was a must. Unfortunately the family connection didn’t result in the entrance fee being waived! In the extension there’s an interesting exhibition about Cook and his voyages. where there’s a statue of the man himself. He probably never actually lived in the house as his parents moved there after he’d left home for Whitby. Although the house is quite small it was worth the visit and the entry fee (many tourists were standing outside the garden taking photographs without paying to go inside (to be honest, so did I last time I was here!). 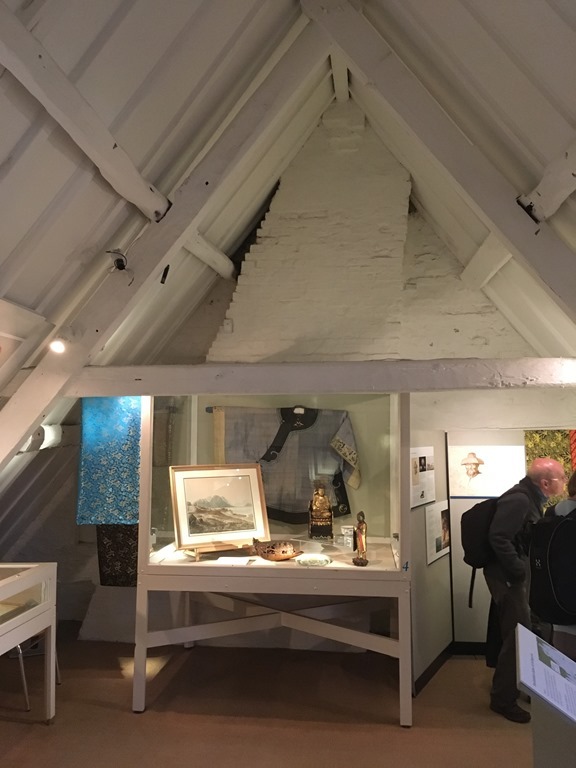 It was interesting to see the reconstructed interior of an 18th Century artisan’s cottage where my wife’s ancestors lived. 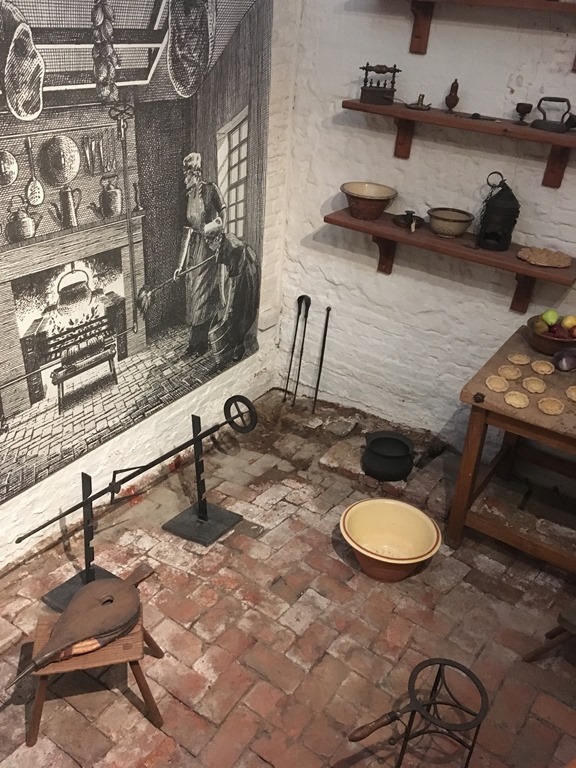 The exhibition was interesting too and the guides, wearing period costume, were very helpful and keen to tell us about Cook and the cottage. 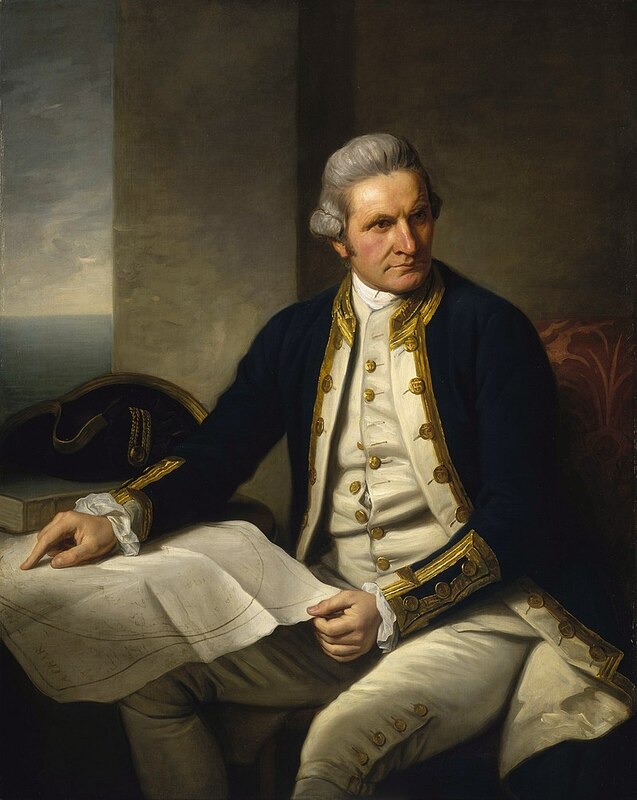 James Cook was a renowned 18th century explorer and navigator who is best known for three epic voyages of exploration and whose accomplishments included mapping the Pacific, New Zealand and east coast of Australia. We have a particular interest in him as he’s in my wife’s family tree – she’s descended from one of his siblings (as are my children, of course!). 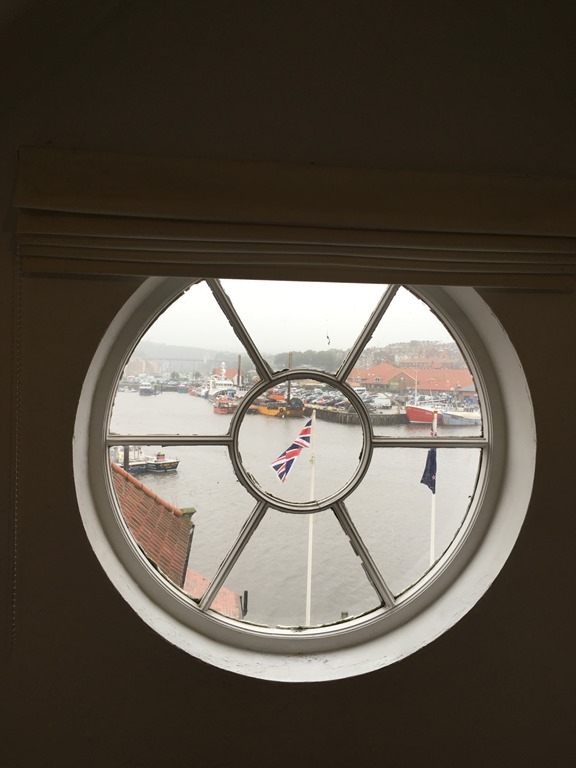 So a visit to the Cook Memorial Museum in the centre of Whitby was a must during our recent holiday there. Especially on a wet Monday afternoon. 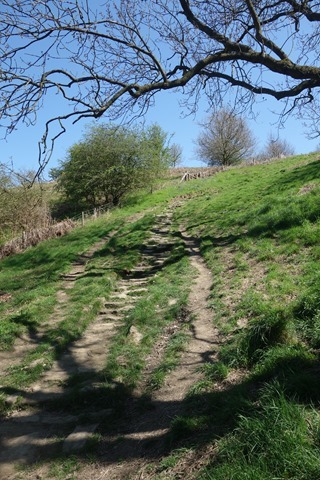 Cook was the son of a farm worker, born on 27 October 1728 in Marton, a small village near Middlesbrough, which was then in Yorkshire. 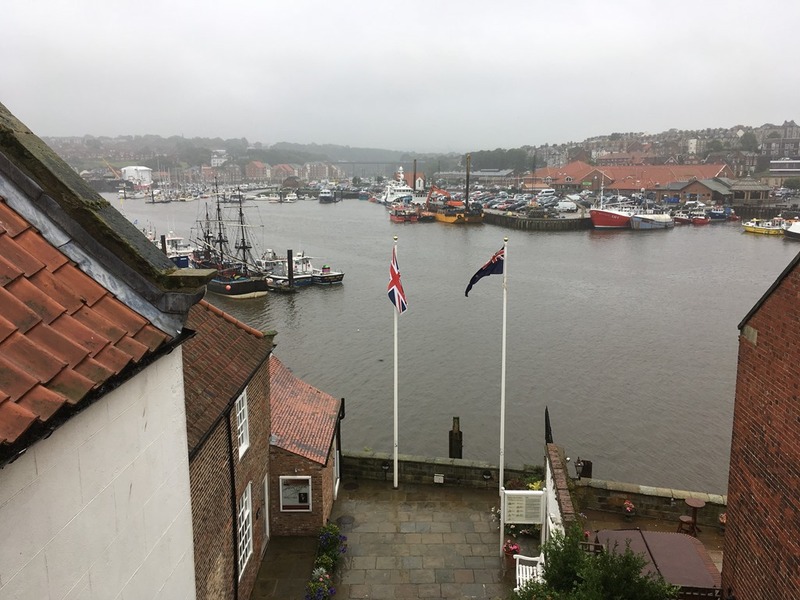 At the age of 17, Cook moved to Whitby to be apprenticed to Captain John Walker, a Quaker, who was a coal merchant and ship owner. 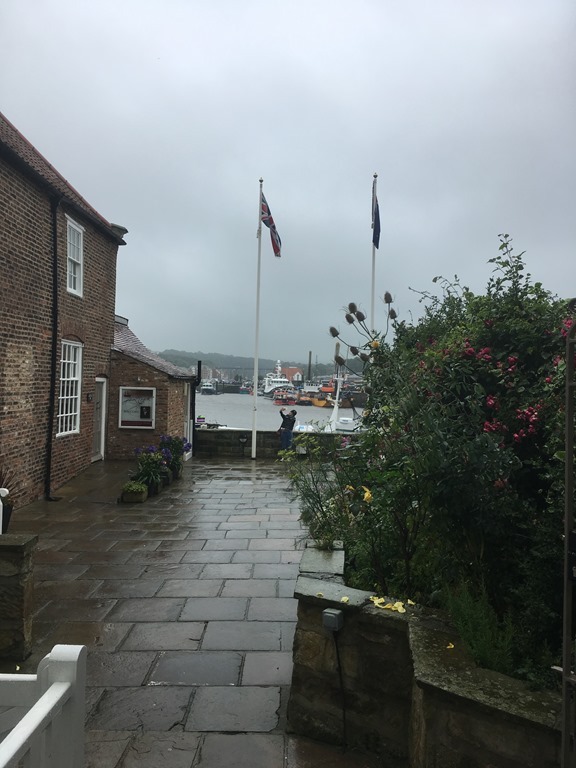 During his apprenticeship he sailed on Captain Walker’s ships and when ashore lived with the other apprentice’s in the attic of the ship owner’s own house in Grape Lane on Whitby’s harbour on the east side of the river. After learning his trade as a seaman he joined the Royal Navy in 1755, working his way through the ranks. 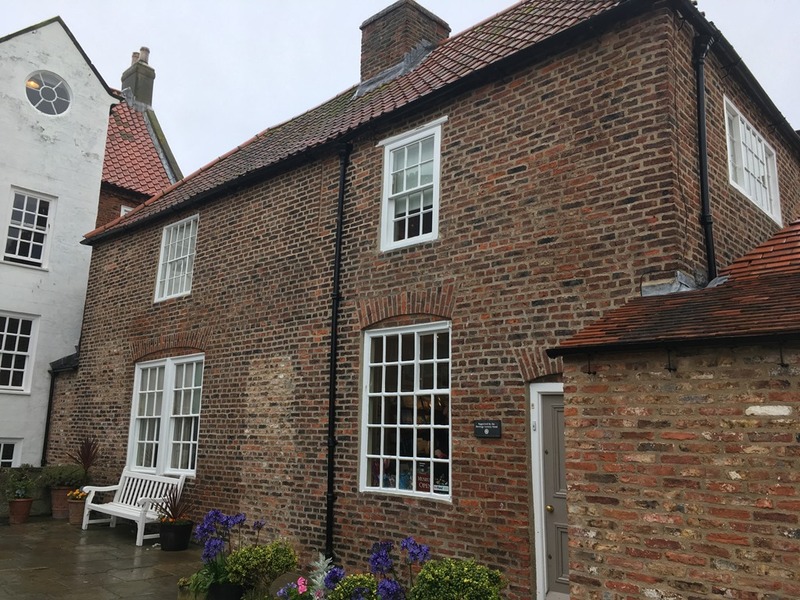 Built in 1688, the house is a good example of a Whitby master-mariner’s dwelling, both a comfortable home and the centre of the family shipping business. 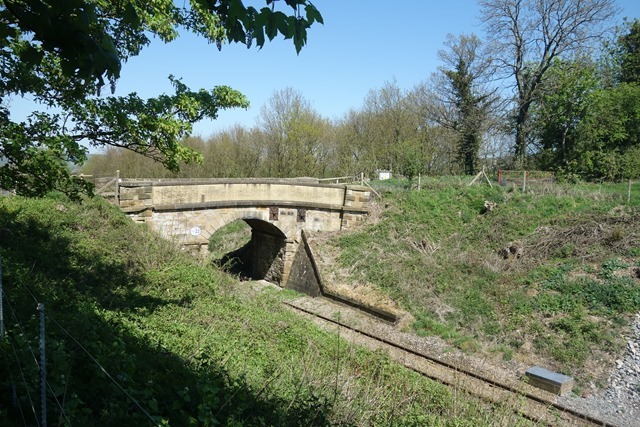 It retains much of its original internal decoration and has been carefully restored. 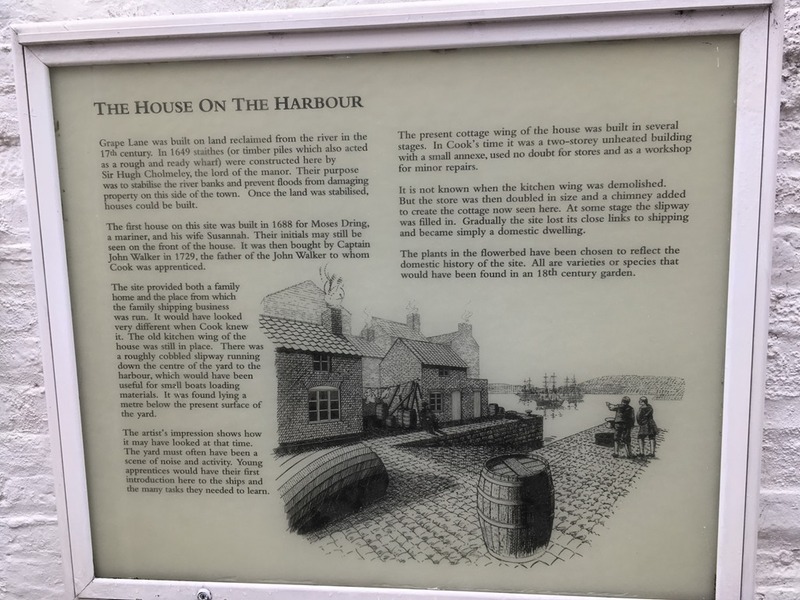 The atmosphere recalls that of a prosperous Quaker shipowner’s home. Passing From here Captain Walker and his apprentices would be able to view his ships. 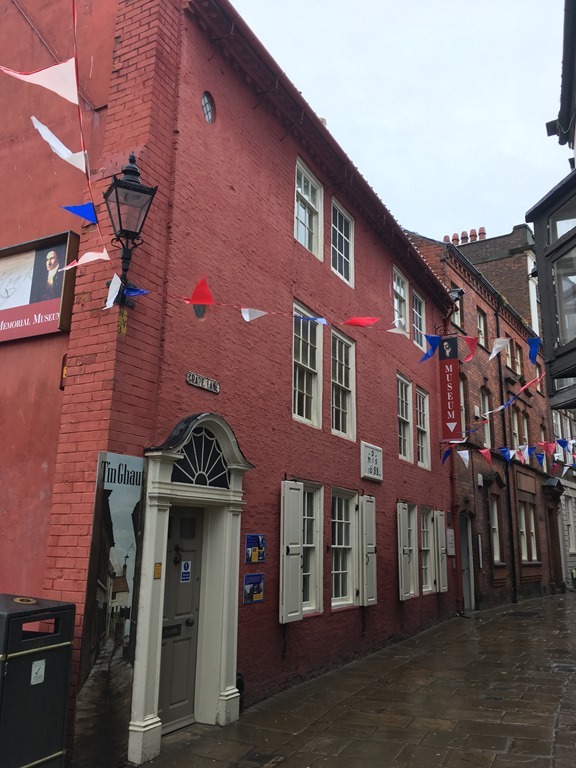 Entry into the museum is via the extension on the back of the original house. 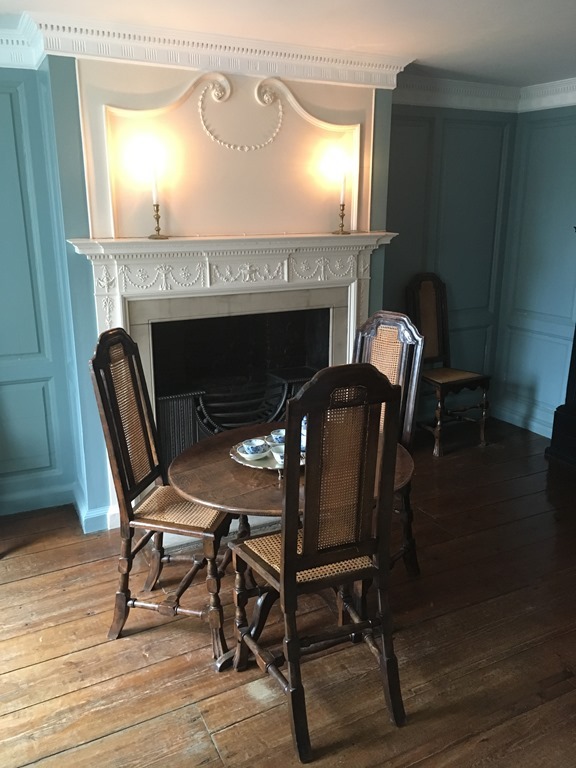 The ground floor rooms are furnished according to an inventory made in the early 1750s. 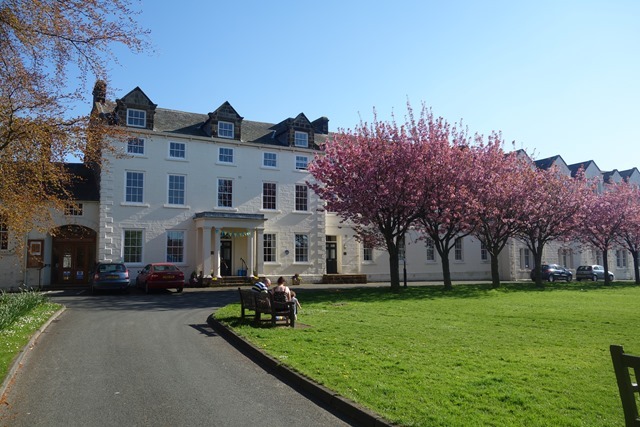 The rooms on the upper floors have exhibitions about Cook’s life and career. We learned that one of the officers on the expedition was a certain William Bligh – yes the same person who went on to captain the Bounty. The room volunteer pointed out the likeness of the figure in the model to Charles Lawson who played the part of Bligh in the well known film about the Mutiny on the Bounty! These were sturdy and reliable, built to service the coal trade. 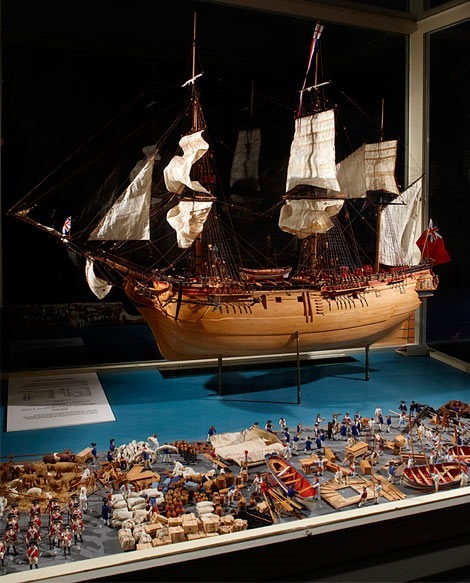 They were capacious and an extra deck could be inserted into them in order to carry a far larger crew, together with stores for up to two years. Another advantage was that collier barks were flat bottomed. They could therefore land on any flattish beach, rather than needing to tie up at a quay in a proper harbour. This was particularly useful when no-one knew what landing conditions would be like. Small boats were also carried for inshore work. In Cook’s time the apprentices would have been quartered in the attic. They slept and spent their spare time here. It’s now used for the museum’s annual special exhibitions. It was an excellent museum. 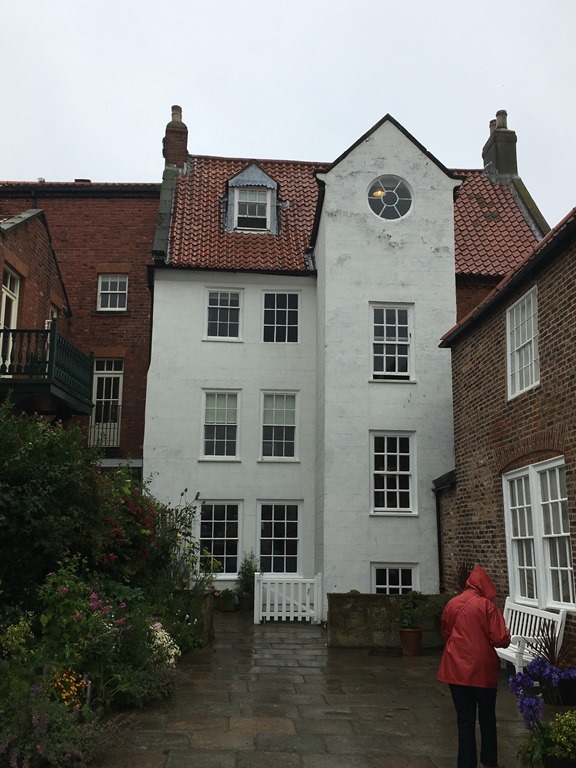 I’d expected to spend about an hour there on a wet afternoon but we ended up staying much longer as there was a lot to see in a relatively small building and we learned quite a lot about Cook, life in a Whitby ship owner’s house, the architecture of houses during this period and also about aspects of seamanship. 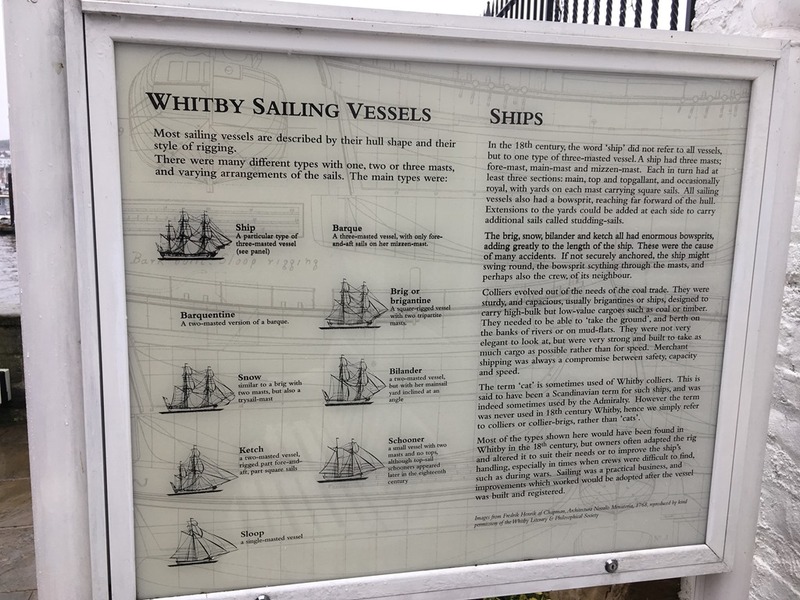 and the other about the various types of sailing vessels built in Whitby. I found this one particularly interesting and learned that a ship was originally a specific type of three masted vessel. You live and learn!! 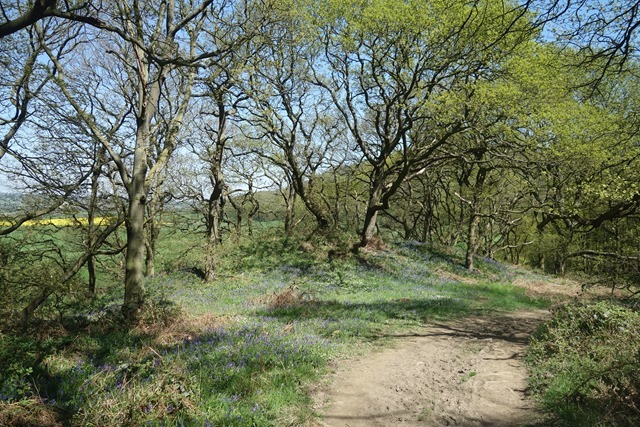 We were travelling back from Sunderland last Monday and as it was forecast to be a fine sunny day (as it transpired to be!) 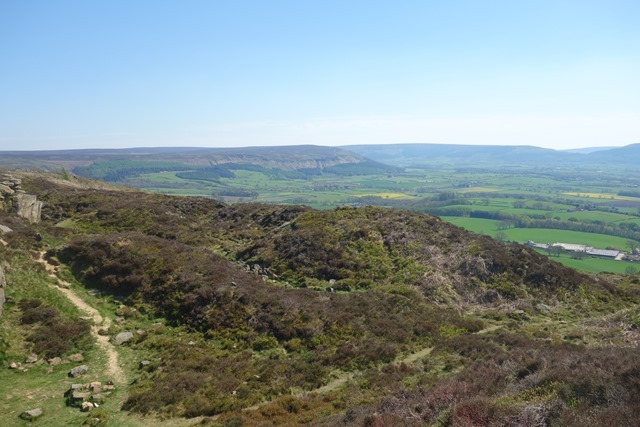 we’d decided to divert off the A19 and go for a walk in the North York Moors. 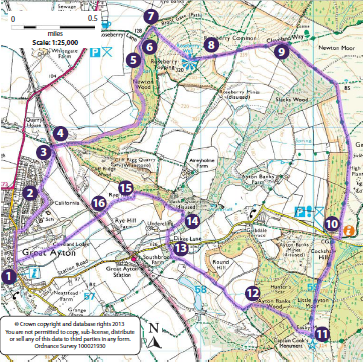 I’d checked out the National Park website where they have a number of walks and picked one that looked the right sort of length through some varied countryside at the north end of the National Park. 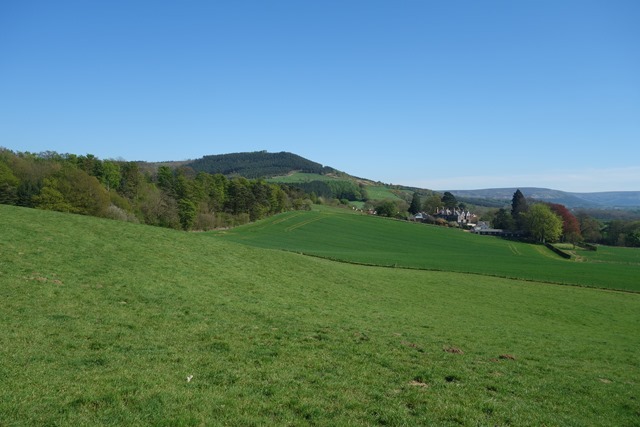 Starting from the village of Great Ayton, it was a circular walk that would take us over two hills, the second of which was topped by a monument to Captain Cook. 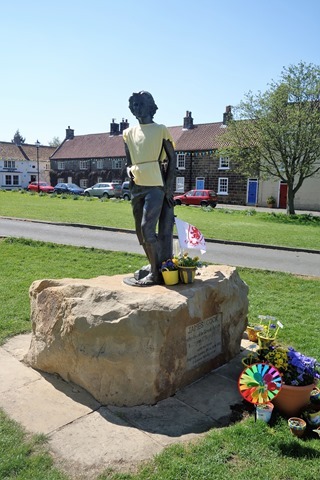 James Cook was born in the nearby village of Marton but in1736,when he was 8, his family moved to Airey Holme farm at Great Ayton, where his father’s employer, Thomas Skottowe, paid for him to attend the local school. 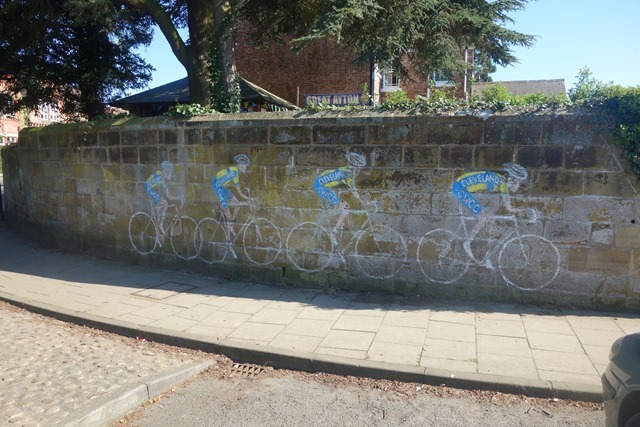 I’d seen the cottage in Great Ayton which was the last home of his parents when I was in Melbourne, in November 2014. It had been dismantled and shipped out to Australia where it was re-erected in Fitzroy Park. 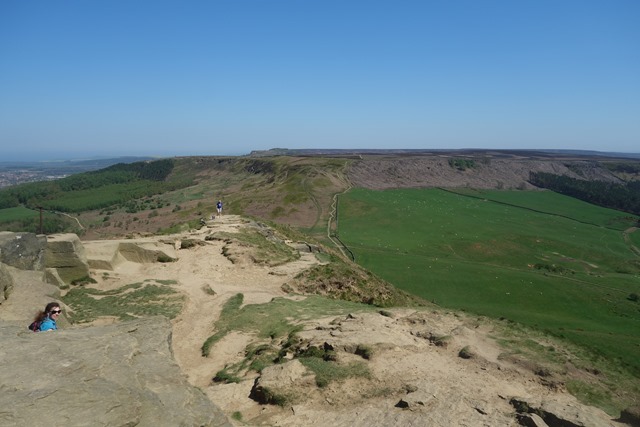 There’s a family connection with Captain Cook and this area. My wife and, therefore, my children, are descendants of one of his siblings. 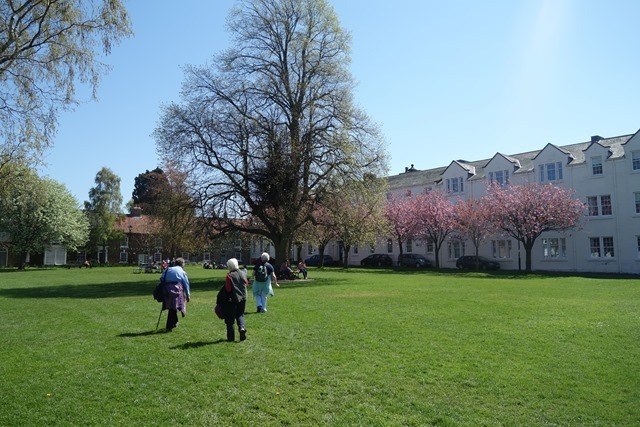 So, we parked up in the village, close to the village green and the Tourist Information office. It’s a pleasant little place, especially on a warm, sunny day. 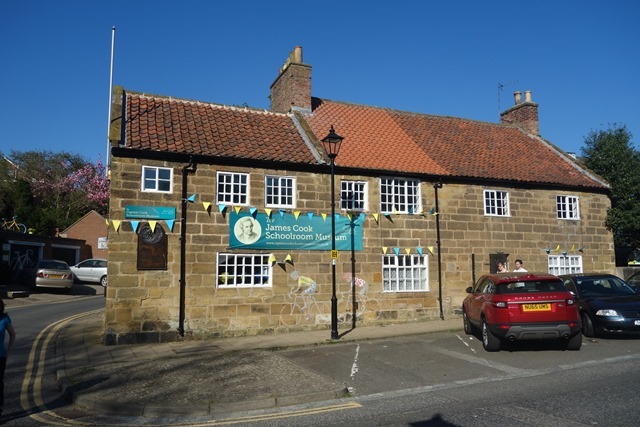 The old school house has been turned into a museum. 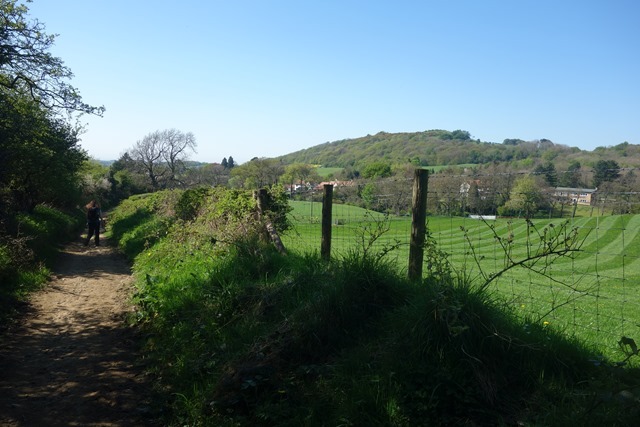 We set out through the village, crossing a field and then the single track railway line that runs to the north. 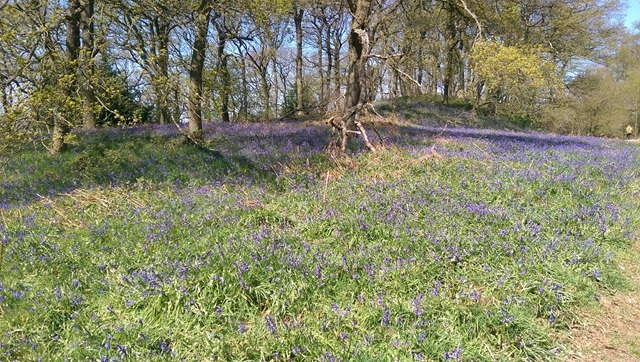 Our route took us through woodland, where the bluebells were in bloom. 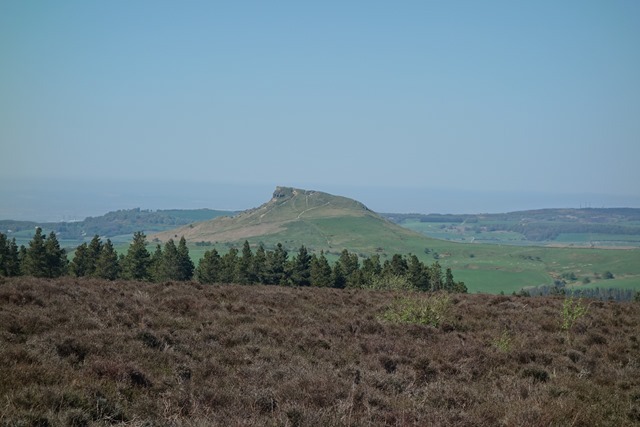 Eventually we got our first view of the distinctive summit of Roseberry Topping, our first hill, which is owned by the National Trust. 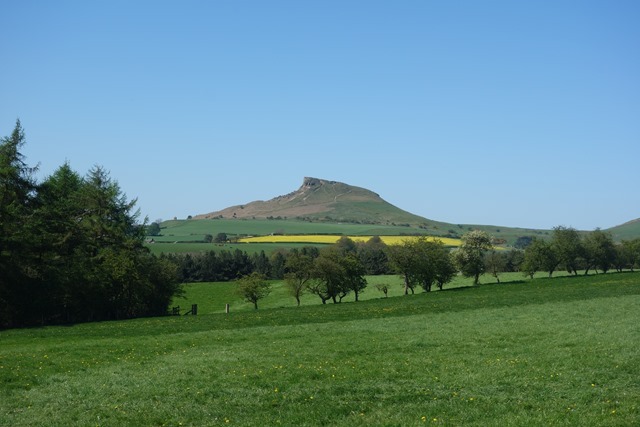 At just 1,049 feet (320 m) high, Roseberry Topping may not be the biggest hill you’ll ever see, but it will certainly be one of the most distinctive. 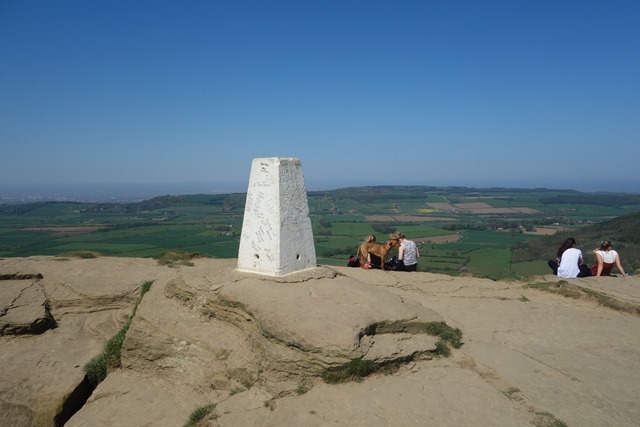 Its shape, caused by the combination of a geological fault and a mining collapse in 1912 has made the hill the most beloved landmark in the Tees Valley area. 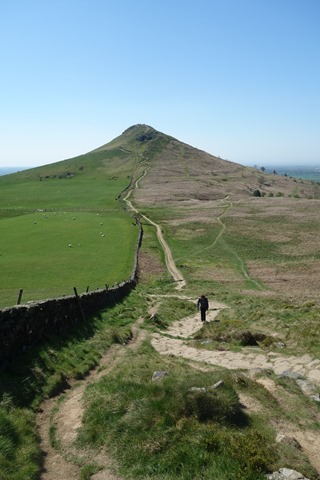 With its half-cone summit and jagged cliff, some say it reminds them of the Matterhorn in Switzerland. 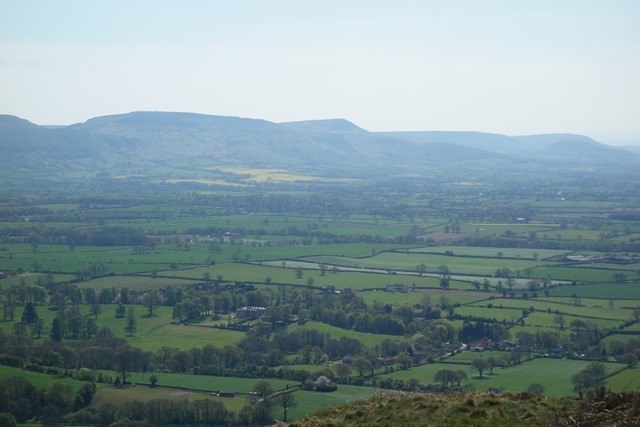 where we were rewarded with fine views over the surrounding countryside. 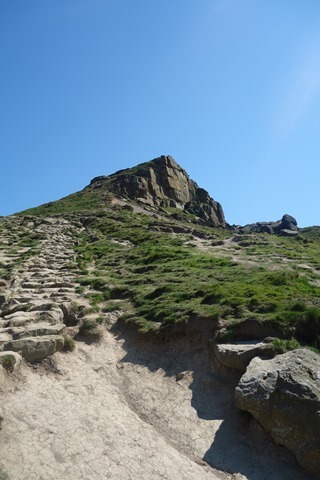 It’s said that the young James Cook would climb to the summit, enjoying the opportunity for solitude. But he wouldn’t have had much of that these days, as it’s a popular destination. It was quite busy but, with careful framing and timing, I managed to avoid too many people being in shot when I took my photographs! 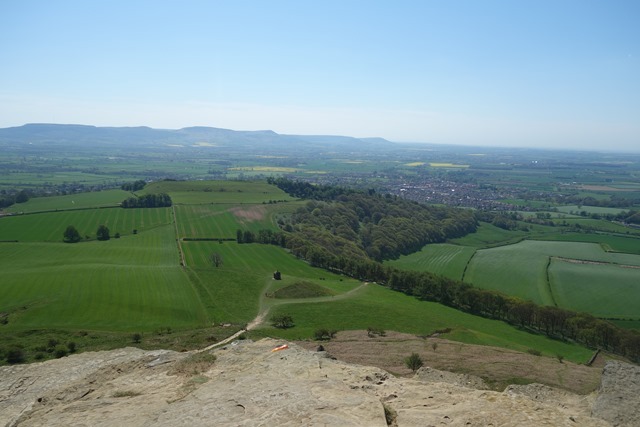 This is the view looking back towards the east face of Roseberry Topping. and then on to our next destination. 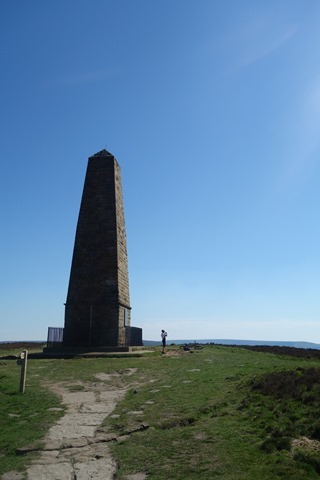 The summit of another hill where there’s a monument dedicated to my wife’s relative! 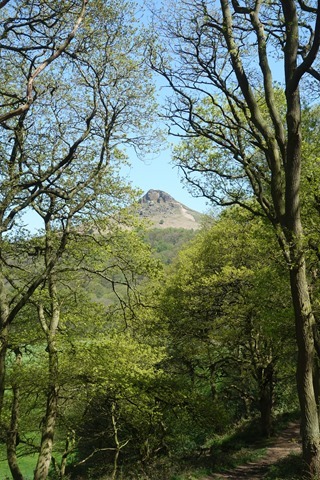 Looking back to Roseberry Topping, zooming in with my camera. 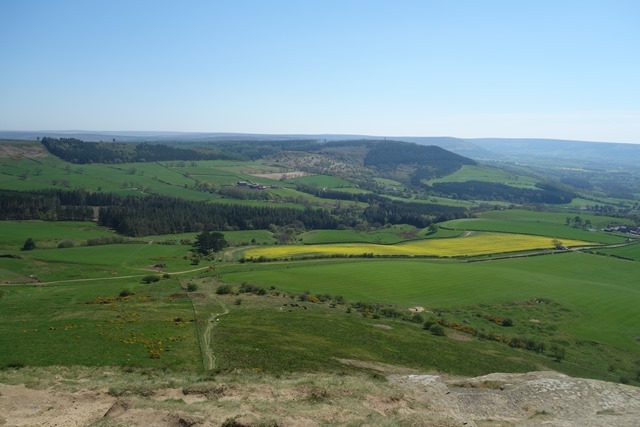 There were good views across the North York moors. 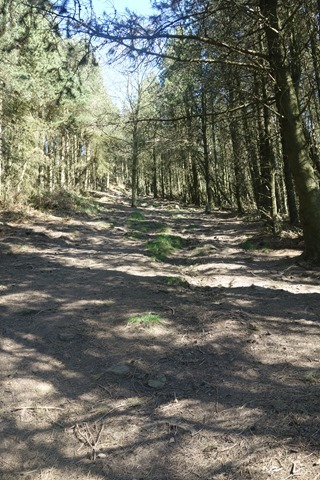 Then we set off down the steep path through the pine woodland. 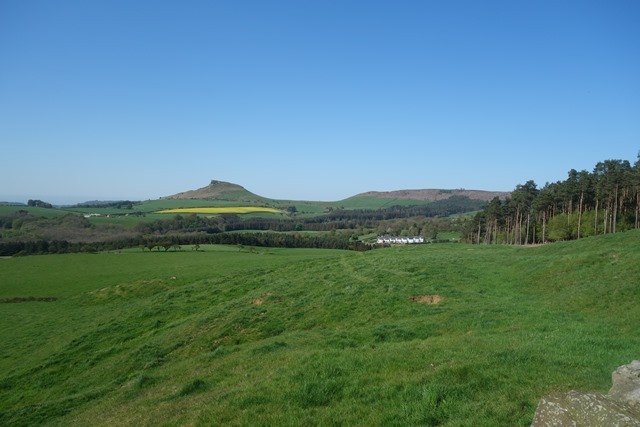 At the bottom of the hill there was a good view of Roseberry Topping and the moors we’d walked across. 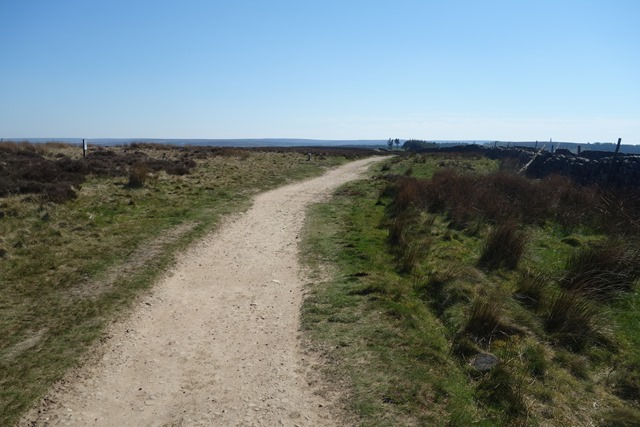 It was a good walk through varied countryside – fields, woodland, a couple of hills and wild moorland. 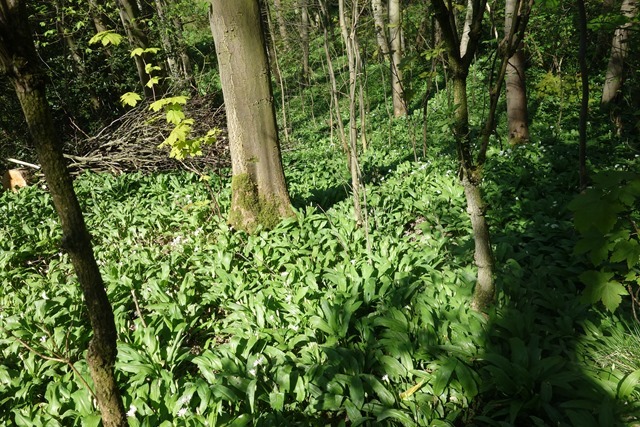 It could get quite muddy in places, but recent dry weather meant that other than a few places (especially in shaded woodland) it was relatively dry underfoot.